I first read this series years ago before the third one had even come out and I loved them! They were so fresh and exciting and just wow. I decided to reread them because I got a request wanting me to do a review for the series. Reading them now, being older and all, I still think they are pretty dang cool. But they're not quite as good as I remember. They are dark and gritty and fun with tons of adventure. Reading it before I would give it 5 stars... reading it now it gets 4. Also after rereading it, the movie wasn't as bad as I first thought. It hits a lot of the important key points... the acting was pretty awful though and Jace was very underwhelming in the looks department but still... I'm very excited for the TV show, anyone else with me? I did see some of the actors and actresses they got and I don't know... I'm just going to have to wait and see I guess. I'm very excited the Shadowhunter world is still around and more books are going to be released. I do like the author's writing style, I always have. It's very simple and flows nicely. I'm not even going to tell you guys to read this book because pretty much everyone already has because they are freaking awesome sauce. First of all, I had wanted to read it for a very long time because it had good critics, the story seemed great and I love series, you have more time to love the characters. When I learned a movie was going to be made, I bought the books to read them before the movie (I hate going to see a movie without having read the book when there is one). I wasn’t disappointed. It’s a great story, with a lot of imagination, and you can easily believe in the story, I mean the author doesn’t make huge mistakes about how this new world works. I think it’s really hard not to make any mistakes when you write about a world that doesn’t exist, you have to work on every detail because people need to believe in this new world and when something feels wrong, the reader doesn’t believe in it anymore. The only thing that wasn’t really clear was when people could see the Shadowhunters or not (they are demon hunters and people are not supposed to see them), I didn’t understand this very well. The story is well constructed and you never get bored. I had a problem at the beginning because there was too much action and not enough thoughts. It felt like a succession of actions where you didn’t get the feelings of the characters enough. I felt a change around page 300 or a little before, after they went to the vampires’ lair. Much more feelings, still a lot of action but it was better written since that part of the book. Maybe it’s just my imagination but I really felt a change. Anyway, a really great book if you like young adult fantasy novels. It made me think of a lot of other books because I read a lot, but it has its differences, I loved it and I can’t wait to read the following books. I loved this series so much, I've read it a few times now. Jace is one of my favorite hotties of all time. Clary is real and cool. But it's the other characters, Isabelle and Simon, that totally round this book out for me. I'm a total fangirl. That being said, I finally sat down and started reading City of Bones.... and I finished it a few days later. I would have had it read in less time than that, but I kept being dragged away from my reading spot by friends. When I did get to read, I couldn't put it down. I even found myself trying to read it all bleary-eyed and delusional from lack of sleep. Cassandra Clare has a way with words! "So when the moon's only partyly full, you only feel a little wolfy?" Clary asked. "Well, you can go ahead and hang your head out the car window if you feel like it." Luke laughed. "I'm a werewolf, not a golden retriever." Love this! I seriously chuckled so many times as I read this book. I also want to give props for the world building. The Shadowhunter aspect was original and captivating. A lot of effort was made to make the modern world blend in with this super secret alternate reality. Everything worked well together and was believable. You could imagine this setting as you read. Obviously, I enjoyed City of Bones. I'm hooked. I shall be reading the rest of this series soon because I need more Jace. Nice concept, great characters. Can't wait to see where it goes! I loved the plot, loved the story, loved the way author Cassandra Clare pulled you in. But I was caught I will be reading the next book but was this truly a young adult book? There was language, not just a little ALOT! So I want to say there was no need for it. No I am not a prude I just thought that it was not needed in the story. And some things I think were just thrown in here and there that the book could have done without. I like Clary's character just a typical teenage and well written! I liked Hodge and all his "shadiness" Jace was well written but what happened towards the end, all of a sudden Jace becomes someone different? Overall great book, cannot wait for the movie. The City of Bones by Cassandra Clare was a pretty good book with amazing twists characters. This review will be pretty short because I don’t want to give away anything. My favorite thing about this book was all of the twists and unexpected things that happen. At first I was pretty confused and at the end I was confused to but my confusion was resolved. Everything that I was confused about was explained about later. But all of the things that happen are crazy and pretty darn unexpected. For me if I cant guess what will happen then I think that the author did a really good job writing the book. There was one part that had me laughing. I want to think that it had a love triangle but honestly there really wasn’t and I cant tell you why because it will give away a major plot point. Now I get into the characters, always my favorite part. First there’s Clarissa, or Clary. She’s so open with her thoughts that I love her. She feels things a lot and is a very curious person. Then there’s Jace. Oh my god, he’s just plain oh I don’t know. The main thing that I want to say about him is that he’s very unemotional, at least outwardly but inside and from time to time he lets the Clary know what he’s feeling and when he does he lets it all out. And all of the other characters are amazing too. There’s Simon, Isabelle, Alec and a ton of others. One of the other things that I really enjoyed was the writing style. She writes really good and I just didn’t want to put it down. As I said before I really loved all of the plot and all of the twists and the characters. I give this book a five out of five stars. I recommend it to YA lovers, I thinks it’s a high fantasy book. I really loved this book. NOTE: I had gifs in my review of this, but it doesn't allow it, so read it on my goodreads! I finished this book without dying, y'all! This post is going to contain spoilers. I have never finished a book that's been rated 1 star. I wanted to throw this book, burn it -- anything to keep it from making my eyes pop out of my head. I don't even know where to begin with this review, but I'm giving it a shot. I wanted to like this book, I really did. Clockwork Angel and Clockwork Prince was -- I have no idea how -- amazing. I tried to read City of Bones last year but stopped on page 177 because it was just a godawful read. After reading the first two books of The Infernal Devices I questioned my judgement on C.O.B. I thought, 'Hey, maybe it wasn't as bad as I thought. 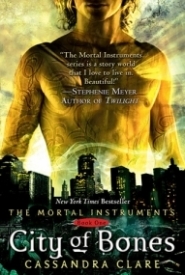 This prequel series will give me more insight on The Mortal Instruments, so it would probably be a decent read'. Wrong, wrong, WRONG. Clary was just annoying. I hated her. She was a waste a space, she screamed over the simplest of things, she was a coward, she always forgot Simon was around, and she was in the way of things. I can't believe Alec is even called a Shadowhunter when he's never killed a demon in his life and he had the nerve to say Clary can't handle what they're about to face. Hey, Alec, at least Clary killed ONE demon. Cassandra Clare copied Harry Potter: J.K. Rowling says 'Muggles' for humans; Clare says 'Mundies'. Rowling says 'Squib' for a witch/wizard without any magic, but is a pureblood; Clare says 'Ifrit'. Rowling writes flying motorcycle; so does Clare. In the Order of the Phoenix by Rowling, Sirius gave Harry a picture of the organisation Sirius and the rest of some people took part in before Voldemort killed half of them off... well, in CoB, Hodge gives Clary a photo before Valentine goes bad and killed off half of his group. What happened to a little something we call Originality? Whenever Clare tried to be funny but fails horribly. 'Dinnertime!' It was Isabelle, standing framed in the door of the library. She still had the spoon in her hand, though her hair had escaped from its bun and was straggling down her neck. 'Sorry if I'm interrupting,' she added, as an afterthought. 'I might be able to eat a bite,' admitted Hodge meekly. 'So stop doing it,' Jace advised her reasonably. - Yeah, Clary, despite the fact your mother was fighting off demons and how they snatched her; making the line go dead, you never failed to say, 'Mom, I'm home.' What were you expecting: your mom coming out the kitchen asking if you wanted a sandwich? Clary felt a scream rising in her chest: 'Mom!' she shrieked. 'Where are you? Mommy!' She hadn't called Jocelyn 'Mommy' since she was eight. Really, Clary, really? A chapter ago you were going off on your mom telling her how you could take care of yourself and how you're 'practically an adult'. He cut a glance toward Jace, who was walking a few paces ahead of them, apparently conversing with the cat. Clary wondered what they were talking about. Politics? Opera? The high price of tuna? What the hell did I just read? Was this supposed to be funny? Clary wondered if there were any ugly vampires, or maybe any fat ones. Maybe they didn't make vampires out of ugly people. Or maybe ugly people just didn't want to live forever. You know what, this is going to take forever because I have 60% of this 'book' bookmarked with crap I need to write down and I'm too lazy to write them. I can't believe I'm going to read City of Ashes, but it's only because people are telling me the series will get better. I hope so. This was a new plot that I had never read before. It was nice, and I really like it! Jace! Clary actually got on my nerves quite a lot. She seemed like she was always in the way, and Mrs. Clare seemed to write it that trouble just followed her. But the characters are really original, their personalities really shine through.